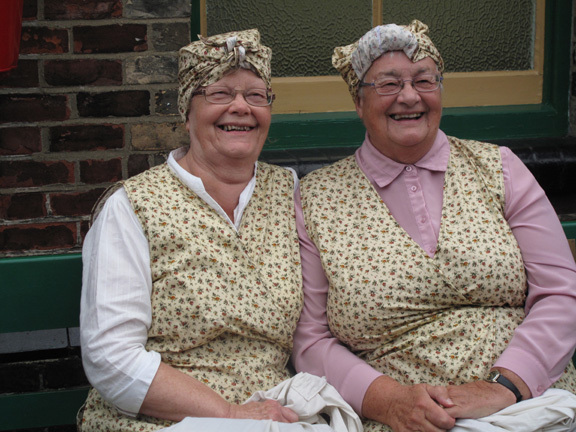 The women in pinnies and turbans are dressed for Sheringham’s 40s weekend. Lots of people participate and dress up to suit the era. For some it’s an opportunity to be an airman, soldier or sailor for a day or two. I noticed that American uniforms far outnumbered English ones (they are sexier, the uniforms, that is). It’s enough to make you think it was the Yanks what won the war. The ladies confessed that their lovely pinnies came from Ebay. Sheringham, if you don’t already know, is in Norfolk. This entry was posted in Photography, street photo and tagged 1940s weekend, 40s weekend, Norfolk, pinnies, Sheringham. Bookmark the permalink. ← Who was the artist?